You may have noticed that the Amersham Carnival did not take place in 2014, but that did not stop our team of float builders continuing our tradition of building something to impress the people of the town. With the various events commemorating the centenary of the start of the Great War we were approached by Amersham Town Council to see if we could help them. They wanted a WWI aircraft, so discussions started and Andy and Doug decided it should be an SE5a, one of the most successful fighters of the war and naturally they would be making it exactly the same size as the original. And so the ’back room’ became an aircraft hanger and gradually it appeared, made from wood and cardboard and covered (like the original) with painted fabric. Detailed plans were used to make it as authentic as possible, the only real change was the cockpit had no seat or floor to allow visitors to climb in from below to have their photo taken. 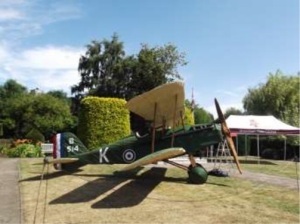 The plane made three public appearances in Amersham and the leaders looking after it had constant praise from visitors. The plane has been stored in Amersham by the Town Council as it has been very hard to transport, but we are delighted to say that it will have a permanent home in RAF Halton. Where it will appear in some of the events they are staging to commemorate the First World War. If we get any details of where it can be seen we will let you know.